Dubai’s beautiful hotels go all out in celebration of the holy season, and while I prefer a calm iftar at home with family where we can give leftovers to those in need, I do enjoy experiencing the beauty of tradition the way these five star hotels interpret it as a night out every now and then. So much thought is put into presentation of food, twinkling lights and lanterns, the live oud player, the majlis seating and so much more. So, here’s a round up of some of my personal favorite Dubai hotel Iftar buffets in Ramadan 2018! Decorated with charming Ramadan lanterns, crescents and glorious lights, Manzil Downtown’s courtyard is a great place for observers to break the fast with hot and cold mezze, 4 live food stations serving Ouzi, Shawerma, Saj and Falafel. Plus, two main courses and four skewers of grills will be served directly to the table. Guests can enjoy traditional juices and desserts such as traditional Kunafa and fresh fruit platter. 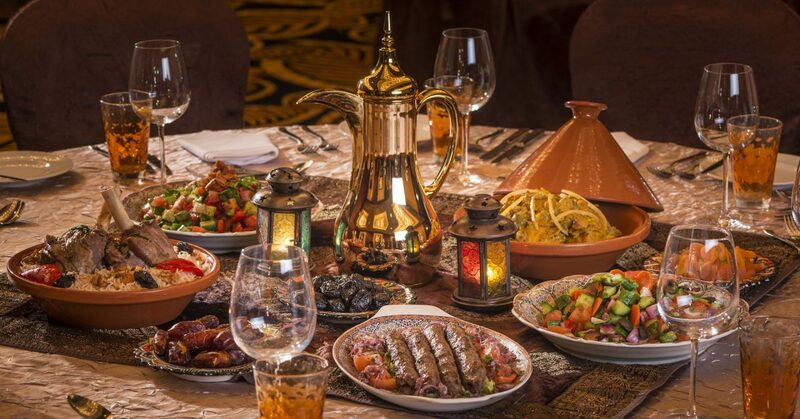 Price: Iftar – 195 AED per person including soft beverages and Arabic juices. Children below 6 years dine free. 50% discount for children between 6 to 12 years. All aboard! The Queen Elizabeth 2 is a docked hotel that will open an Arabian majlis offering a unique iftar and suhoor for the first time this year. Definitely something you can talk about at your next dinner party! The purpose-built majlis, which is located on the ship’s largest deck, can host up to 250 people offering an expansive Arabian buffet including live cooking stations, traditional Emirati dishes, fresh salads, hot and cold mezze, and abundance of desserts. 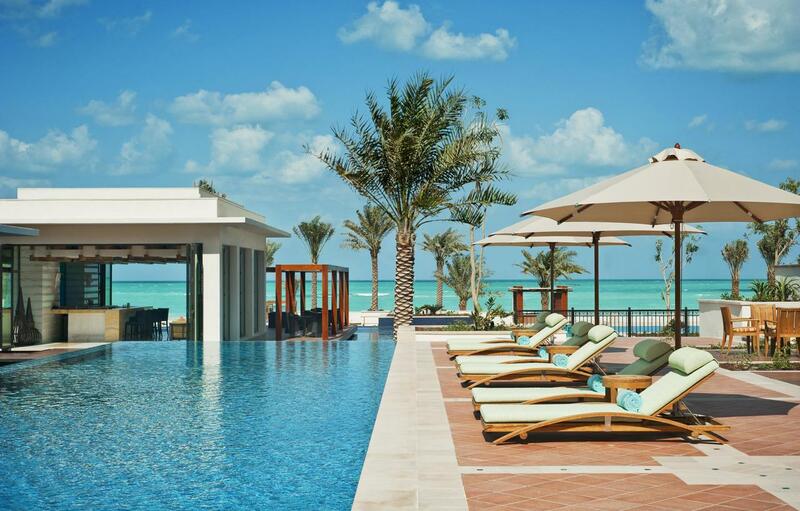 Open for both members of the public and in-house guests, diners can choose to sit in the brand new Lido restaurant or in the air-conditioned Arabic majlis which will serve shisha, too. AED 250 per person (inclusive of buffet and soft beverages), AED 125 for children below the age of 12, Complimentary for children below the age of 4. 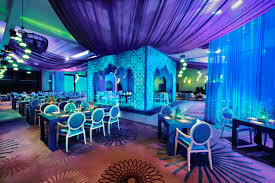 The Fairuz Ramadan tent is beautiful, bathed in blue and purple light, with a varied display of food that includes Arabic and international cuisine. 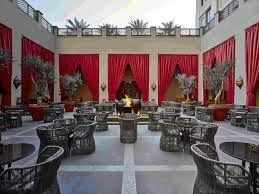 Adjoined to Fairuz, the outdoor Arabian courtyard will be transformed into a fully air conditioned tent with traditional entertainment and shisha. For a truly palatial experience, Palace Downtown is a great place to take out of town guests to break the fast in a venue that is grand without being overwhelming, a gem tucked next to the Burj Khalifa. 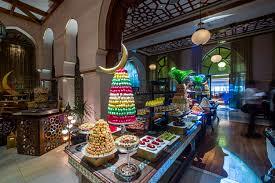 The presentation of food is fantastic here, with towers made of dates and food stations that include a diverse mix of Asian, Indian, Arabic and international cuisine. 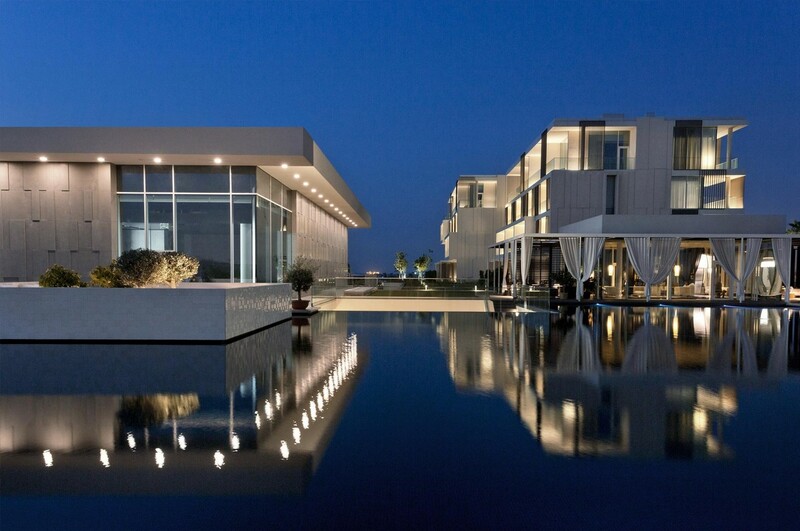 You can either dine in a seating area or in a beautifully decorated majlis. It’s one of my favorites this year! Price: AED 255 per person and 25% off during the first week of Ramadan only, inclusive of buffet, Ramadan juices and water; children aged between 6 and 11 dine at 50% off and children aged below 6 dine free. Pricey? Yes. But it’s a unique experience you’ll probably do once in your life and talk about for a while. This Ramadan, book a table at the world’s highest restaurant, At.mosphere to marvel at the stunning views, then make your way through the chef’s special four-course menu. Unlike a typical Iftar, the menu includes a selection of international hot and cold appetisers such as Foie Gras, Spiced Aubergine; rustic soups like Wild Mushroom Veloute; Pan Seared Sea Bass, Lamb Rack, Gnocchi for main course besides other contemporary European delicacies. Look out for an array of indulgent desserts including Tonka Bean Ice Cream with malt crèmeux, Lemon Meringue and Smoked Chocolate Fondant.